U.S. Geological Survey scientists and cooperating partners are examining the potential risk to aquatic resources (for example, wetlands, streams) by contamination from saline waters (brine) produced by petroleum development in the Williston Basin of Montana, North Dakota, and South Dakota. The primary goals of this study are to provide a science-based approach to assess potential risk of brine contamination to aquatic systems and to help focus limited monitoring and mitigation resources on the areas of greatest need. These goals will be accomplished through field investigations that quantify brine movement and risk assessments using remotely-sensed and other spatial datasets. 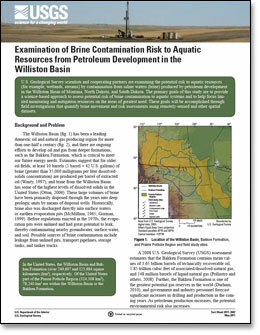 Gleason, R.A., Thamke, J.N., Smith, B.D., Tangen, B.A., Chesley-Preston, T., Preston, T.M., 2011, Examination of brine contamination risk to aquatic resources from petroleum development in the Williston Basin: U.S. Geological Survey Fact Sheet 2011-3047, 4 p.